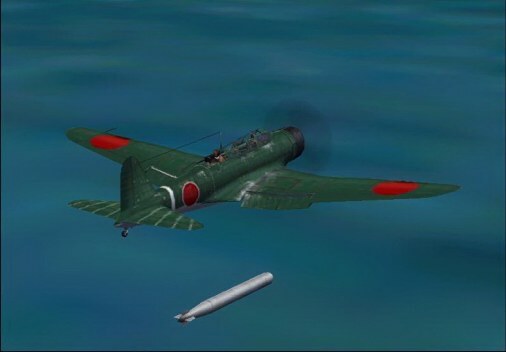 Nakajima B5N2 Kate, CFS2 torpedo bomber, with droppable torpedo. 51kb. See readme for simple installation instructions. This is a superb aircraft by itself, with all the niceties of CFS2 aircraft including open/close cockpit, highly detailed aircrew, etc. But perhaps the greatest feature of this craft is that it can drop actual torpedoes, which will perform exactly as a torpedo should, by entering the water and travelling submerged until hitting its target. Be sure to read the readme included for the pathetically simple instructions! This is a CFS2 AI aircraft converted to be flyable by the human pilot.